Find out how server-to-server (S2S) tracking works and learn how to properly set it up for your Pops and Push campaigns. 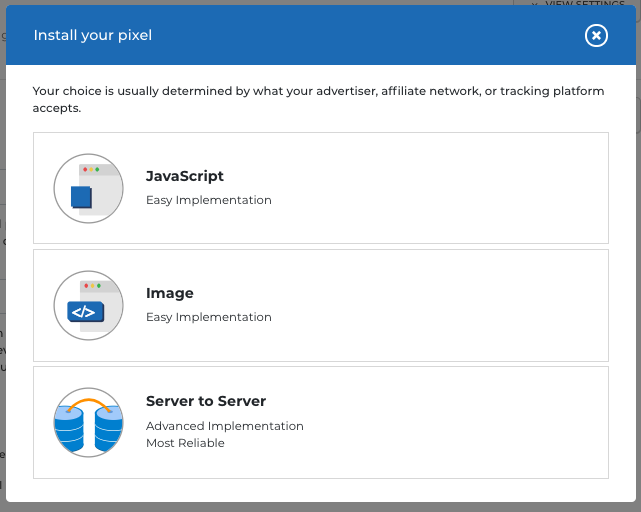 Our most successful advertisers use pixels to track conversions in RTX Platform. Without this data, you don't have the insights you need to make optimization decisions that drive higher profit. By installing a conversion pixel, you'll see conversion data like profit, CPA, revenue, and more in RTX Platform reporting. Why use server to server pixels? Follow the instructions below to implement S2S tracking and learn how the process works. 1. Create a pixel event and assign it to your campaign. Follow steps 1-5 in this article to create and assign your pixel event. 2. Select Server to Server from the modal. 5. (Optional) Edit your S2S code to pass conversion value. You can set a conversion amount in your Campaign Settings that will track the same payout each time your pixel fires, however, you can override this conversion amount with a static or dynamic value by editing your pixel code. Learn more about tracking revenue. 6. Place your S2S code with the affiliate company. Your affiliate company should have an option for you to place your S2S code. Once you've made the above edits to your S2S code, copy and paste it into your offer via your affiliate company. 7. Sit back as the magic happens! Your affiliate company will replace the parameter you appended to the S2S code with the click ID value that populated in your offer's URL. The affiliate company then sends this code back to RTX Platform to let us know that the click associated with the appended click ID lead to a conversion event, and RTX Platform will record this conversion event and the associated revenue, which you'll see in your RTX Platform data. Depending on your tracker and/or affiliate network, you may need to complete each of these steps for each unique RTX Platform campaign. 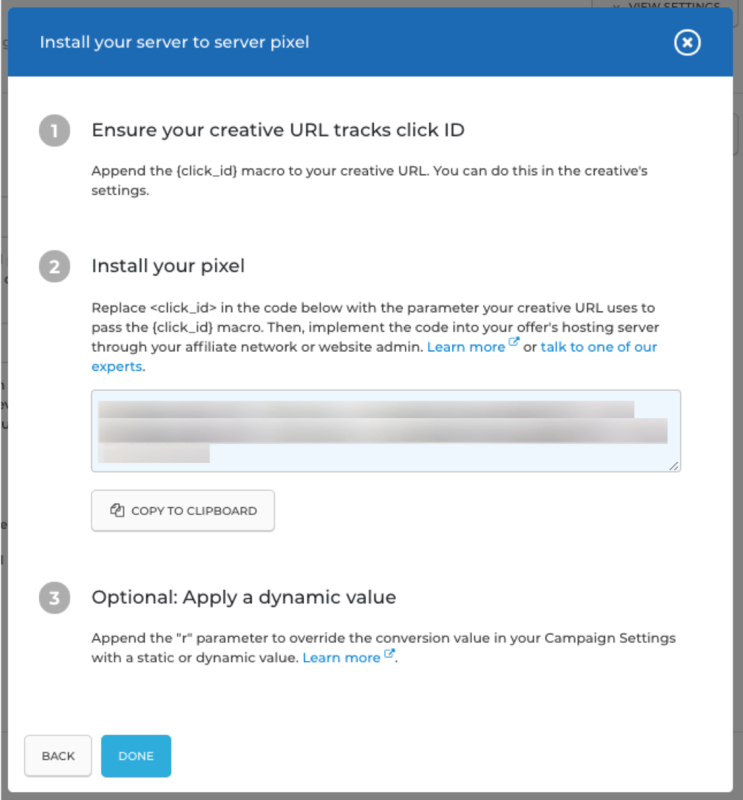 Watch our video on how to install RTX Platform's conversion pixel to optimize your campaigns!